Crackling Copper uses a central strand on beading wire, with a chain and clasp set at each end. It’s a pretty simple necklace to put together, it just needs a certain amount of preparation before the stringing actually starts. 1. Stamp some copper discs with a crackle pattern, using permanent black ink. I used the Staz-On brand with good results. Spray the discs with a matte varnish if you’d like. 2. Slide some 6mm turquoise glass beads onto head pins, and turn simple loops for each. 3. 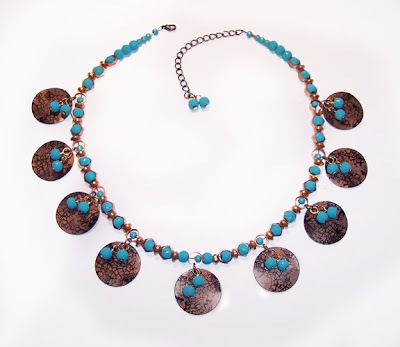 String your beading wire with 4mm and 6mm turquoise glass beads, alternating with copper beads. I used copper open hex beads with 6mm turquoise beads inside them, and alternated with copper rondelles. Put the smaller 4mm beads inside the hexes that will have copper discs hanging from them so that there will be room for a jump ring. 4. Crimp the ends to a lobster claw clasp and a chain. Add a couple of beads on head pins to the end of the chain. 5. Attach a jump ring around a hex bead with a 4mm bead inside, and add a copper disc and a beaded head pin. 6. To each of those jump rings, attach another jump ring with another beaded head pin.